A little shorter of an episode than usual for me, but also one a bit on the political side of things this time around (yet again -- though hopefully this won't be a usual thing), here is my belated episode discussion of the recent Mark Gatiss story, 'Sleep No More'. Inside you'll find some happy Jessica Jones gushing, some allusions to ancient rad vs. trad fandom debates, chat about transphobic microaggressions and internalized prejudice, and a wee bit of roller derby squeeing thrown in for good measure. So, anyway, I hope you all will join me for my review and episode discussion. And, as always, glad to have you all aboard. Enjoy the ride! 0:09.10 - Discussion of "Sleep No More"
Coming to you a bit later than I'd planned (bad head cold + some Jessica Jones bingeing is a deadly combination for this podcaster, apparently), here is my episode discussion of the recent Zygon 2-parter. This was definitely one of my more personal episodes and certainly most political (which is admittedly odd to me), but then since the story was very political itself, I suppose it was somewhat hard to avoid? Oh, and this was also recorded before the recent Paris attacks, so any similarities to such discussions are entirely coincidental. In this episode, I discuss identity politics (especially when it comes to Osgood), Zygons in the closet (likely not what you think), the awesomeness that is Jenna Coleman and Peter Capaldi, and revisiting the classic 'Terror of the Zygons'. Also included is some Harry Sullivan love, random music interjections, gratuitous skating references, some podcasting shout-outs, and probably way more than you ever needed to know about how I punch my Queer Card. Also, many coughs were sacrificed to the cutting room floor, but I still managed to come off sounding quite a bit gravely again due to my sore throat. So, anyway, I hope you all will join me for my review and discussion of both 'The Zygon Invasion' and 'The Zygon Inversion'. And, as always, glad to have you all aboard. Enjoy the ride! 0:13.03 - Discussion of "The Zygon Invasion" and "The Zygon Inversion"
Long podcast episode is long. And late. But them's the breaks during a confluence of technical issues and illness, I suppose? Still, it's finally here, nonetheless! Now, full disclosure, this episode was actually recorded before the second part 'Before the Flood'' aired, so obviously some of my speculation and predictions didn't quite turn out to come true, of course, but, hey, some of them did! You can even play Nicole-is-right-or-wrong Bingo, if you'd like -- though I don't have any pre-made Bingo cards for the occasion, unfortunately! Anyway, I hope you all will join me on this episode, as I gush about the newest episode of Doctor Who. And, as always, glad to have you all aboard. Enjoy the ride! + Radio Times: What Was on the Doctor's Prompt Cards in Under the Lake? Despite some trials with illness and internet issues (curses, Mercury Retrograde! ), this intrepid podcaster has finally prevailed and so thus, this episode is finally done and dusted and ready for your consumption. BUILD HIGH FOR HAPPINESS! Oh, wait...that's another story. Anyway, within you will find my discussion of the conclusion of the S8 opening story, "The Witch's Familiar". Admittedly, I get a bit punch-drunk and somewhat naughty at points (woo, cold medicine! ), so the listen might be entertaining or even frightening by some of your standards, but I hope you enjoy it nonetheless. So, yeah, I hope you all will join me on this episode, as I gush about our newest exciting episode of Doctor Who. And, as always, glad to have you all aboard. Enjoy the ride! 0:12:17 - Discussion of "The Witch's Familiar"
0:40:54 - Coming Soon on the Next Episode! Plus Goodbye, Thanks, and Outro! + Overnight figures for BBCA! A little later than I anticipated -- still getting used to fitting in all the podcast work all by my lonesome! -- but here is my discussion of the S8 opening story, "The Magician's Apprentice"! Of course, how this story is going to end is the grand mystery of the hour, but that's cool, I still found there was more enough to talk about within part one (and what a part one it was!). I'm back to the full-style episode format for now, along with the return of my old friend, Happy Fandom Time (which there is so much to be happy about in the Whoniverse these days -- it was hard to contain myself!). My voice is admittedly still a bit gravelly (though I did take care to edit out any coughs), but I think everything is a-ok. Anyway, join me on this episode as I gush about our newest episode of Doctor Who. And, as always, glad to have you all aboard. Enjoy the ride! 0:09:51 - Discussion of "The Magician's Apprentice"
0:31:58 - Coming Soon on the Next Episode! Plus Goodbye, Thanks, and Outro! + Recommended Related (Or Mentioned) Serials Available in the New Terminus Amazon Online Store! Finally, here's my belated thoughts on Series 8 and the incumbent Twelfth Doctor, which are admittedly -- spoiler! -- a full-on love fest. This was recorded the next day after I recorded my previous episode about the 10th anniversary of New!Who, so I apologize that my voice was still a bit crackly from getting over that sore throat, but I think it sounds basically all right (besides didn't a lot of classic Hollywood sirens have raspy voices? Um... not that I'm a classic Hollywood siren in any sense!). Again, this is a 'mini-episode' of sorts, and again, its admittedly not that short despite the diminutive episode status, but as I said before, I just wanted to have a breather to rework the schedule going forward, so I did this bonus-style episode. After this, Series 9 is starting up and I'm planning on reviewing those stories as they come out and then, gods willing, hopefully this Podcast-Train will no longer be derailed (also, fingers crossed that there's no homicidal ancient soldier-mummy systematically killing everyone on said Podcast-Train, by the way, because that would just be very, very awkward). Choo choo! Anyway, join me on this episode as I gush about series 8 of Doctor Who, including extolling the virtues of PCap's lovely eyebrows and Jenna's smashing flapper dress. And, as always, glad to have you all aboard. Enjoy the ride! 0:44:45 - Coming Soon on the Next Episode! Plus Goodbye, Thanks, and Outro! IT'S ALIVE! Galvanizing lightning has struck, the stars have aligned, the hecatomb of Daleks sacrificed, and despite recording with a bit of a scratchy-and-sore throat, a new episode is now in the can! It's debatable if it is a 'proper' episode, I suppose, as the format is a bit different from usual, so I've decided to just call it a 'mini-episode' (though admittedly, its not very short or anything). I'm just now trying to get back on the horse and rework the recording schedule going forward, since so much has happened between this episode and the last one. SO MUCH! Either way, I'm back now, giving this another go, with a chat about the 10th Anniversary of the new series and a look back at the episode that started it all, 'Rose'. I also have some new station idents from Andrew Cartmel and Sylvester McCoy to debut as a little bonus, because, well, they make me super-happy! Anyway, many, many apologies for the extraordinarily long wait, but also many thank-yous to those who've been listening all this time and cheering me on to return to my podcast again. 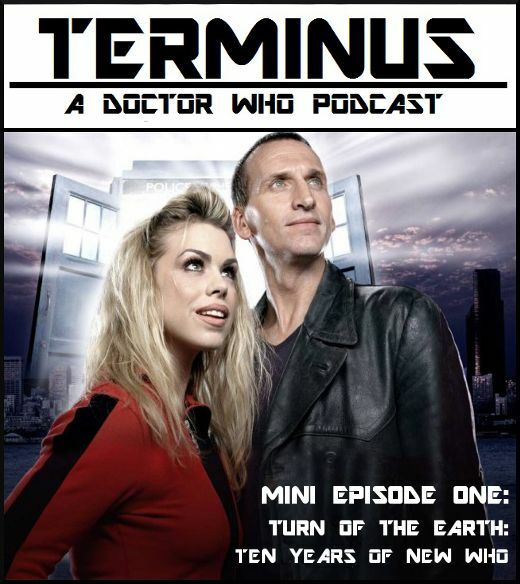 Join me on this episode as I chat about ten years of the new series of Doctor Who and also the episode Rose, the latter of which I'm not very nice about, to be honest, so you've been warned! And, as always, glad to have you aboard. Enjoy the ride! 0:39:58 - Coming Soon on the Next Episode! Plus Goodbye, Thanks, and Outro!